Farm Safety Week 2016 takes place from July 4th – 8th! 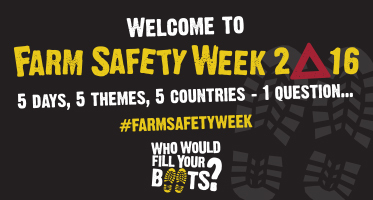 Today marks the start of the fourth annual Farm Safety Week, an initiative launched in 2013 aiming to reduce the number of accidents which continue to give agriculture the poorest record of any occupation in the UK & Ireland. Each day of Farm Safety Week focuses on a different theme – falls, machinery, livestock, transport and children on farms. We’ll post tips and farm safety advice by theme each day during the week. Farm Safety Week is supported by the Farm Safety Foundation, Farm Safety Partnerships, the Health & Safety Executive, Health & Safety Executive for Northern Ireland and the Health & Safety Authority, Ireland. Farm accidents can happen on any farm, when you least expect it. You may feel invincible due to the fact that you have been fine up until now. You may think ‘why do I need to change the way I do things, I have had no accident’ but now is the time to review the safety on your farm before an accident occurs. Farm Safety is a huge problem on Irish Farms. Irish farmers need to focus on how they can make their farm safer for themselves, their families and visitors. Every farm should have a safety statement and a plan of improvements that need to be done to the farm to increase the safety of the everyday tasks on the farm. Everyone one that live on the farm or visits the farm regularly should be made aware of the dangers on the farm. There should be designated play areas for any children on the farm and signs up to make play areas visible for visitors. When working alone you should always let someone know where you are going and an estimated time of when you should be back. You should also have a mobile phone with you at all times so you can call someone if you get into difficulty. We are urging all farmers to keep farm safety a priority on farms as you go about your daily tasks and be sure to make any improvements necessary to make your farm safer.